The Icelandic Sheepdog is a breed of dog of spitz type originating from the dogs brought to Iceland by the Vikings. It is of similar type to the Norwegian Buhund, the Shetland Sheepdog, and the Welsh Corgi. They are commonly used to herd sheep in the Icelandic countryside. Icelandic Sheepdogs are tough and energetic. Hardy and agile, they are extremely useful for herding and driving livestock or finding lost sheep. However, the dogs are not known for hunting. They are very alert and always give visitors an enthusiastic welcome, without being aggressive. Friendly and cheerful, the Icelandic Sheepdog is inquisitive, playful, and unafraid. They generally get along well with children, as well as other pets. A photo of a dog described as an Iceland Dog, printed in W. E. Mason's Dogs of all Nations in 1915. The Icelandic Sheepdog very much resembles dogs found in graves in Denmark and Sweden from about 8000 BC. Dog imports to Iceland were limited and from 1901 even forbidden. In 1650, Sir Thomas Brown wrote, "To England there are sometimes exported from Iceland ... a type of dog resembling a fox ... Shepherds in England are eager to acquire them!" Plague and canine distemper destroyed over 75% of the breed in the late 19th century, leading to a ban on the importation of dogs to Iceland. 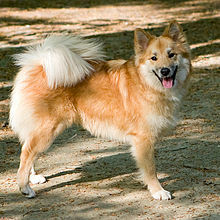 The purebred Icelandic Sheepdog was again bordering extinction in the late 20th century and in 1969, the Icelandic Dog Breeder Association (HRFÍ) was established to preserve the breed, among other aims. The Icelandic Sheepdog often has two dewclaws on each hind leg. ^ a b "Icelandic Sheepdog Dog Breed Information". American Kennel Club. Retrieved 2015-09-17. ^ a b "Icelandic Sheepdog" (PDF). FCI. Retrieved 27 February 2015. ^ Mason, Walter, Esplin (1867). Dogs of all nations (1915). Retrieved 24 November 2010. ^ "AKC Welcomes the Cane Corso, Icelandic sheepdog and Leonberger". akc.org. Wikimedia Commons has media related to Islenskur Fjárhundur. This page was last edited on 26 January 2019, at 15:19 (UTC).